Borough maintained their four-point lead a the top of the table with a relaxing but not comfortable result against mid-table Hathern. 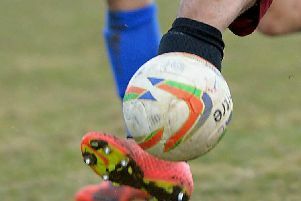 With Saffron winning by the same margin at home to Friar Lane it maintains their push for the top, but it is in Borough’s hands to clinch their second title in two years. Borough made three changes from the Saffron game, Josh Turton coming in for Brandon Oddy, Michael Ellis in for the injured Alex Baird and Ben Nicolson in for Sam Beasley who was unavailable. Borough should have taken the lead on two minutes when a mazy run from Harley Matarutse enabled Turton to shoot on goal but the keeper made a confortable save. The Hathern keeper again came to their rescue first a snap shot from Glasscoe was destined for the corner, the keeper stretching himself to turn the ball around the post. From the corner more pressure from the Borough forwards as Chater headed goalward for the keeper to make an incredible save and then followed up by saving a point blank header from Nicholson. Hathern also had their moments after some confusion in the Borough defence firstly the 7 was free on goal an fired his shot wide and in all honestly Hathern should have taken the lead on 20 minutes when from a corner their 9 was completely free in the box and some how missed the target. The half ended with more spurned chances for Borough and with Hathern tiring it seemed a decent time to pounce. However HT came with the score at 0-0. The second half started with Hathern creating problems for Borough down their left side and the nippy 11 crossing into dangerous areas on two occasions but coming to nothing. It was the introduction of returning player Aiden Print on 60 minutes which turned the game and on 65 from a Print run and cross Michael Ellis soared above everyone to power home into the net. Print then beat two players and crossed for Chater to head wide and Print again providing the ammunition from a corner this time Glasscoe screwing wide Borough increased their lead on 84 mins and made the game safe Harley Matarutse starting and then finishing off a neat move on the left hand side. With Hathern pushing to get back into the game Borough notched their third two minutes from time, Pritchard toe-poking the ball home after again some good work from Aiden Print. TEAM: Biddle, Chater, Whittam, Nicholson. Glasscoe, Byrne, Ellis, Chater, Matarutse, Ellis Finney, Subs Pritchard, Print. Borough are back in action this Saturday at Kilsby Lane when they host Allexton & New Parks. Borough have already taken three points from New Road with a 5-1 win, with goals from Sheldon Berkley (2) Harley Matarutse, Brandon Oddy and a OG back in December. Kick off is at 3pm and admission is £3 Adults and £1 concessions. 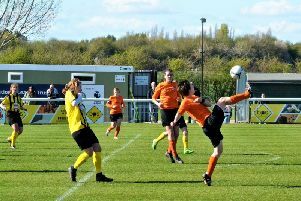 After 25 games, Rugby Borough lead the division on 61 points, Saffron Dynamo are second on 57 from 24 games, Thurnby Rangers are third on 55 points from 27 games and FC GNG are fourth with 53 points, having played 25 games.